Many gamers love tweaking their army lists to get the most out of them. They look for any points-saving measure they can find. 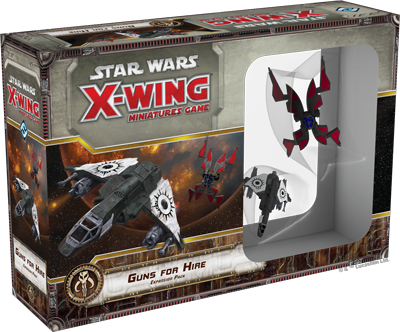 Well, the Guns for Hire expansion for the X-Wing Miniatures Game gives Scum & Villainy players several new options to do just that. One such is the Vaksai title. It reduces the costs of upgrades to the ship it's on. The Vaksai Title is something of a conundrum. Unlike the StarViper Mk. II Title, which applies a flat three-point reduction, the Vaksai Title starts at zero points and only gains squad-point value as you load your ship with upgrades. The more upgrades you add to your Kihraxz fighter, the greater the squad-point value your Vaksai Title offers. Traditional wisdom, however, warns us against spending too much time—and too many squad points—loading our ships with upgrades. At the end of the day, X-Wing is a game about lining up shots, aiming, and firing, and it behooves us to throw as many attack dice as we can reasonably modify toward success. At the same time, we want to defend against our opponents attacks with as many points of agility, hull, and shields as we can. Squad points spent on upgrades are traditionally less valuable than points spent on ships, then, because the attack and defense bonuses associated with upgrades tend to be more expensive than those associated with the ships themselves.